Extension offices all over the state this time of year get a host of calls dealing with tomato problems. This growing season is no different, but one particular disease issue has been a bit more prevalent this year. Let me introduce you to this garden foe, and what to do if it shows up. Southern Stem Blight, sometimes called Southern Stem Rot, is the not so welcome visitor this year. As with most garden disease, high temperatures and moist conditions favor disease development. 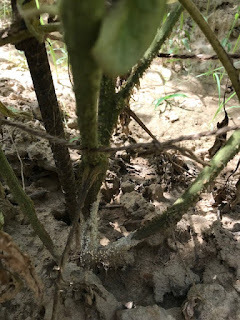 The pathogen can survive as sclerotia for years in the soil or plant debris and can easily spread through the movement of infested soil and infected plant material. The most noticeable symptom of Southern Stem Blight (SSB) is a sudden and permanent wilt caused by the rotting of the stem. A brown to black stem lesion that girdles the stem is very often near the soil line of infected plants. When moist conditions exist, a white fungal growth (mycelia) will develop on the base of the stem, followed by tan to brown rounded structures (sclerotia) on the stem base. SSB can also infect the fruit, if fruit comes in contact with the soil, which is highly likely. Tomato fruit will initially appear sunken and yellow at the infection site and become water-soaked and soft before collapsing. This was the case for Mr. Jim Gregory of Winston County. He called and said his tomatoes were fine one day and wilted the next with no response to watering. Among one of the finest gardens I’ve visited the past few weeks, about three to four tomatoes were as good as gone. This was my recommendation to him, as well as you if this problem arises in your tomato crop. from planting to end of harvest. The main thing is to practice good crop rotation to prevent the sclerotia structures from building up over time in the soil. Sclerotia can last for years, so keeping these to a minimum is key. Not just rotation of tomatoes from the area, but other vegetable crops with-in the same family as tomatoes. Lastly, if you have just a few plants, you can place a strip of tin-foil around the base of the stem to prevent contact of the fungus. Tomato’s family to NOT rotate with would be: peppers, eggplant, and Irish potatoes, they ARE in the same family group. It’s not just a good idea to rotate this particular family group, but others as well to prevent a host of other negative conditions. 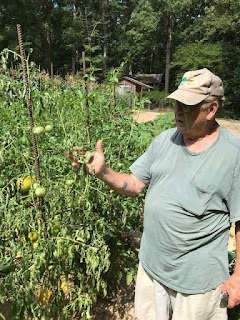 If you’d like to know more about tomato disease, and vegetable production for the home owner, or commercially, contact your local Extension office.